When a head coach is fired mid-season, teams often go back to basics and try to establish the ground game. Brian Filipiak looks at how the Miami Dolphins misdirection running game has gotten them back on track. The Dolphins started the 2015 season with a 1-3 record, which led to the firing of head coach Joe Philbin during the team’s bye week. Since then, the Dolphins have regrouped under interim head coach Dan Campbell, evening their record at 3-3 and pulling themselves out of the AFC East cellar. Backed by a resurgent ground game behind the legs of running back Lamar Miller, the Miami offense scored a combined 82 points in Weeks 6 and 7. Through their first four games, the Dolphins offense ranked 28th in the league in total yards and 30th in scoring, with 16.25 points per contest ‒ eight short of their 2014 average. Miami’s non-existent running attack entered Week 6 next-to-last in the league with 69.3 yards per game. While Miami boasted a 60-40 pass-to-run ratio under offensive coordinator Bill Lazor last season, the offense ‒ partially due to having to play catchup ‒ had passed the ball (171 attempts) nearly threes times as often as they ran it (65 attempts) heading into their bye week. 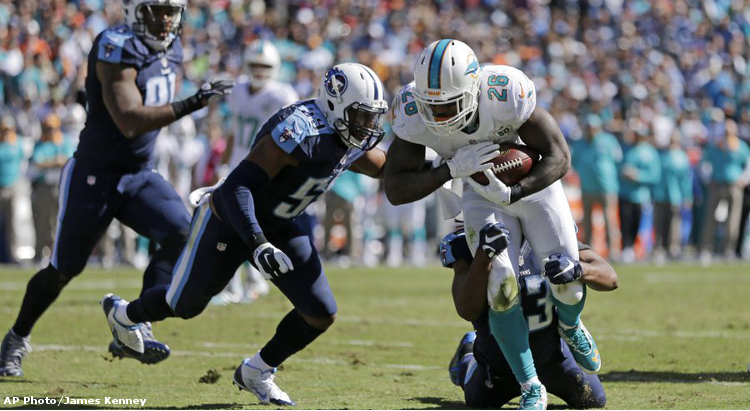 Most impacted by the imbalanced offensive approach was Miller who, fresh off a 2014 season in which he averaged 5.1 yards per carry, had managed fewer than 33 rushing yards per game leading up to their Week 6 game against the Tennessee Titans. In the past two games, however, Miller has been nearly unstoppable, rushing for 288 yards on 33 carries ‒ an 8.7 average. The Dolphins have rushed for 430 yards on 64 attempts (excluding kneel downs) in the last two weeks, lessening the burden on quarterback Ryan Tannehill (56 total drop backs), who had been dropping back to pass 47 times per game. The Miami running game uses a zone-based scheme with no shortage of pre-snap motion and post-snap misdirection that involves tight ends and wide receivers. While Lazor has implemented some more one- and even two- back power runs recently, the Dolphins ground game approach remains rooted out of the shotgun alignment, relying heavily on read option principles, with outside and inside zone concepts. Against the Titans in Week 6 and Houston Texans in Week 7, the Miami offense used a mix of these run concepts with an emphasis on misdirection to test the discipline of opposing defenses. At the snap, the Dolphins entire offensive line takes a lateral step away from tight end Jordan Cameron (#84), who simulates a wheel route to clear the alley defender – safety Michael Griffin (#33) – from the area. As the entire Titans front flows towards the outside zone blocking action – and are subsequently pinned inside – defensive end/outside linebacker Derrick Morgan (#91) is the lone defender remaining on the backside. With a lot of real estate to cover, the unblocked Morgan has to honor the QB keeper on the read option before he can crash the backfield or squeeze off the potential cutback lane for the running back. Tannehill reads Morgan’s positioning and hands off to Miller, who immediately cuts behind the down block by right tackle Ja’Wuan James (#70) and eludes Morgan’s grasp, picking up a 20-yard gain on the play. The defensive front determines which blockers pull and which blockers pin. In this case, the uncovered center Mike Pouncey (#51) and right guard Billy Turner (#77) both pull toward the playside while Jones and Cameron down block the 3 technique and 6 technique defensive linemen, pinning them toward the inside. Although this is a straight handoff to Miller on the sweep, two Tennessee defenders react to the potential QB keeper first. Defensive end DaQuan Jones (#90) uses a swim move to gain penetration into the backfield, but bites on Tannehill’s keeper fake and allows Miller to race past him unimpeded. In addition, inside linebacker Zach Brown (#55) false steps toward the QB, which delays his backside pursuit. Miller bursts into the second level and splits the crease created by the pull blockers, gaining 22 yards on the play. Prior to the snap, Landry motions behind the QB and flares out into the flat, presenting a swing route to the defense. In reaction to Landry’s movement and/or the potential of a QB keeper run to the same side, the Titans defensive front flows hard toward the strong side. In particular, the weak outside linebacker crashes down and completely abandons contain, providing Miller with acres of daylight to exploit on an 11-yard run for an easy first down. Miller motions right to left just before the snap on the swing route. Tannehill fakes the pass to his running back and, instead, hands the ball to Landry on an end around with wide receiver Rishard Matthews (#18) pulling as a lead blocker. The Tennessee defense is once again caught flat-footed on the misdirection play, looking one way while the football heads elsewhere. Landry slashes through the defense on his way to a 22-yard touchdown run. Off the snap, the offensive line takes a lateral step to their right while the tight end – Cameron – pulls back across center to trap the cutback defender ‒ outside linebacker Jadeveon Clowney (#90). Although Cameron badly whiffs on his cut block against Clowney, his movement forces linebackers Bryan Braman (#50) and Brian Cushing (#56) to scrape over one gap. This plays into the hands of left guard Dallas Thomas (#63) who, after working with Pouncey on the double-team against nose tackle Vince Wilfork (#75), chips to the nearby Braman to complete the combination block. From there, Miller does the rest, reading the leverage of his blocks and banging the run inside between the crease created by Pouncey and Thomas. The running back is in the end zone 85 yards later. Wide receiver Kenny Stills’s (#10) movement across the formation expectedly draws one defender his way. But it also entices defensive back Andre Hal (#29) to flow toward the ghost motion as well. Miller takes the handoff and promptly bursts up the middle toward the area previously occupied by Hal for a 13-yard gain. While Tannehill handed the ball off to Miller in this instance, the Dolphins will run the same play with a direct pitch to the motioning wide receiver or use the play-action pass off this concept to keep a defense guessing. A steady diet of read option plays, outside and inside zone concepts, and misdirection packages greatly aided Miami in their Week 6 and 7 victories. And despite the dreadful start to the season complete with the axing of their head coach, the Dolphins nonetheless find themselves back in the playoff mix. A key factor going forward will be Lazor’s continued use of a more balanced offensive approach that is closer to last year’s pass-to-run ratio. As shown most recently, getting the ball in the hands of a home run threat as explosive as explosive as Miller can make a defense’s slightest misstep extremely costly.